CHAMPAIGN, Ill. — A new study finds that 21-month-old infants can distinguish between respect-based power asserted by a leader and fear-based power wielded by a bully. The study, reported in the Proceedings of the National Academy of Sciences, analyzed infants' eye-gazing behavior, a standard approach for measuring expectations in children too young to explain their thinking to adults. This "violation-of-expectation" method relies on the observation that infants stare longer at events that contradict their expectations. 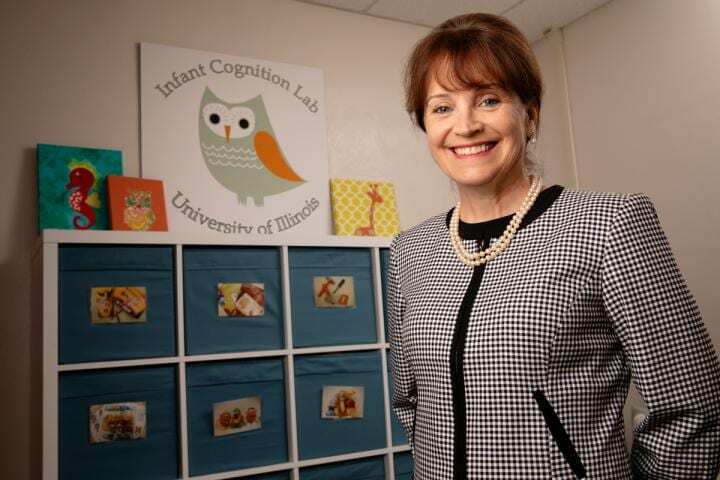 Previous studies had shown that infants can recognize power differences between two or more characters, said University of Illinois Psychology Alumni Distinguished Professor Renee Baillargeon, who conducted the new research. "For example, infants will stare longer at scenarios where larger characters defer to smaller ones. They also take note when a character who normally wins a confrontation with another suddenly loses," she said. "But little was known about infants' ability to distinguish between different bases of power." To get at this question, Baillargeon developed a series of animations depicting cartoon characters interacting with an individual portrayed as a leader, a bully or a likeable person with no evident power. She first tested how adults – undergraduate students at the University of Illinois – responded to the scenarios and found that the adults identified the characters as intended. Next, she measured the eye-gazing behavior of infants as they watched the same animations. "In one experiment, the infants watched a scenario in which a character portrayed either as a leader or a bully gave an order ("Time for bed!") to three protagonists, who initially obeyed," Baillargeon said. "The character then left the scene and the protagonists either continued to obey or disobeyed." The infants detected a violation when the protagonists disobeyed the leader but not when they disobeyed the bully, Baillargeon found. This was true also in a second experiment that repeated the scenarios but eliminated previous differences in physical appearance between the leader and the bully (see graphic). A third experiment tested whether the infants were responding to the likeability of the characters in the scenarios, rather than to their status as leaders or bullies. "In general, when the leader left the scene, the infants expected the protagonists to continue to obey the leader," Baillargeon said. "However, when the bully left, the infants had no particular expectation: The protagonists might continue to obey out of fear, or they might disobey because the bully was gone. The infants expected obedience only when the bully remained in the scene and could harm them again if they disobeyed. "Finally, when the likeable character left, the infants expected the protagonists to disobey, most likely because the character held no power over them," Baillargeon said. The new findings confirm earlier studies showing that infants can detect differences in power between individuals and expect those differences to endure over time, Baillargeon said. "Our results also provide evidence that infants in the second year of life can already distinguish between leaders and bullies," she said. "Infants understand that with leaders, you have to obey them even when they are not around; with bullies, though, you have to obey them only when they are around." To reach Renee Baillargeon, call 217-333-5557; email [email protected] The paper "Infants distinguish between leaders and bullies" is available to members of the media from PNAS.